I’m going to go ahead and clear the air right away by saying that I was never able to beat Kid Chameleon. Believe me, it wasn’t for any effort of trying – there were just so many different ways to approach the game that I ended up spending more time exploring the varied paths to see where I could go. As you can imagine, more often than not, this led me to landing in a level I hadn’t seen before at the very least and teleporting to the dreaded ‘Elsewhere’ at the very most. It wouldn’t be until years later that I discovered just how deep the rabbit hole went. Kid Chameleon arrived on the Mega Drive and Genesis in the middle of 1992 and with the impending trepidation that arrived each summer over the slim handful of games released, I wound up spending a lot of time with the game. Stepping into the sneakers of the badass leather-jacket-wearing kid embarking on a mission to defeat a virtual reality game that’s kidnapping other children, the narrative isn’t exactly award winning. The underlying niche of the game, however, is pretty awesome. 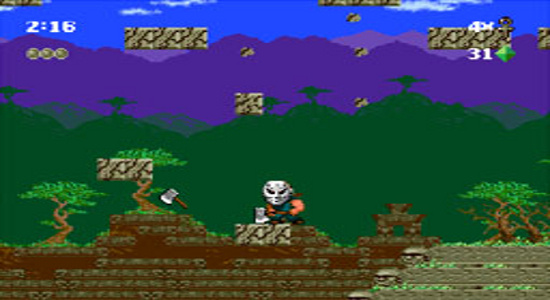 Encountering different helmets in the game allows the kid to change into one of a cornucopia of characters, each with their own unique ability for whatever the task at hand may be. There is Kid Chameleon, unremarkably named Casey in the game manual, which is the basic form in the game. He doesn’t have that many hit points and isn’t terribly cool looking, but he can grab onto ledges and pull himself up, which I suppose is something. On the other end of the spectrum is the Iron Knight, a helmet that, once picked-up, can transform the kid into the most durable character in the game. Not only that, but it allows players to scale vertical walls and bust through floors without a second thought. Eight other helmets allow the Kid to change into a Samurai, Berzerker, Maniaxe (A Jason Voorhees doppelganger), Juggernaut (a giant, skull-shooting tank), MicroMax (A pint-sized fly able to stick to walls), a beam firing EyeClops, hoverboarding SkyCutter or superheroic Cyclone. The sheer amount of variety really did offer a nigh-infinite amount of progression. While moving through the various levels, players would typically end each one by coming into contact with a flag, which would render each area back to its digitized state before rolling a screen detailing the obtained score. Even though this was the primary objective for many of the levels, that wasn’t typically the case. It wasn’t unusual to encounter a gold teleportation pad that wouldn’t just possess the ability to move your character from one part of the level to the other, sometimes you would find yourself in a completely different level than the one you started in. Starting on a level that looked like a 16-bit rendition of the deepest pits of wrought hellfire and ending up on something that looked like a beach from Ecco the Dolphin was ridiculous at the time. While the main path in the game only composed about half of the roughly one-hundred levels, the other half were mostly given over to random encounters via teleportation. But there was nothing worse than being dropped into one of the two-dozen ‘Elsewhere’ areas. This is where a lot of my frustration came from in Kid Chameleon. No doubt, any chance to explore a game and its many various nooks and crannies is always going to be an interesting experience, but when dumped into an ‘Elsewhere’ area by a wayward teleporter, it would be like Magellan landing on a beach only to be promptly punched in the face by a native – repeatedly – before the whole tribe joins in. I’ve never been a fan of levels that perpetually push the player forward, because I believe it places a ticking clock on what would otherwise be an exploratory experience. Sure, it’s fun to have gaming skills tested, but it always just seemed out of place in KC. Nevertheless, arriving in an ‘Elsewhere’ world usually meant that immediately, it was time to run for the right side of the screen as fast as your D-pad could get you there. You could collect all the diamonds and continues possible in the game prior to ending up in one of these levels and if you were unprepared, it would make a vicious treat out of your thumbs. I’m not saying the challenge wasn’t fun – but when your thumbs are sore as hell and you’ve lost count of your attempts – then it starts losing a bit of its charm. Regardless of whether or not I would end up in one of those damn levels though, I still keep coming back to Kid Chameleon on occasion. Because exploration is still more interesting than not playing the game period, despite the frustration and, well, the game does have a pretty awesome soundtrack in addition to being a pretty solid platforming title. 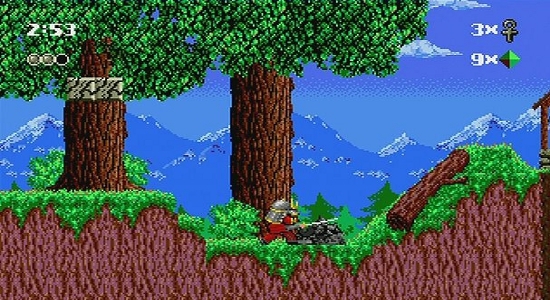 If you haven’t checked it out before – you can get it on the Virtual Console and one of the many slews of Genesis collections Sega has released. If you can handle a modicum of aggravation, Kid Chameleon shouldn’t be missed. Not like Star Control, that game’s still a nightmare.